Naomi Sirad is a woman whose troubled life compels her to leave Tel Aviv for Jerusalem with the hope to have a fresh start. Moving into a new apartment, seemingly in a quiet neighborhood, she learns that a woman that lived in the same apartment committed suicide but her piano is still there, which will play a significant role in restoring Naomi’s confidence in herself. Naomi, what you will learn in the beginning, had an unsuccessful suicide attempt and luckily survived. While the reason is not given as to what exactly led to such a desperate moment of her life, Naomi seems to be struggling even more now when she tries to stay away from the piano left by a woman whose attempt to take her own life succeeded. But soon, when the troubled young pianist meets, at first, Simcha, a mute preteen boy from an orthodox family, and later on, Maya, an activist who seeks answers, Naomi’s life will take an unexpected turn. Naomi’s challenges continue as the new neighborhood does not welcome her the way she expected. Her family continues worrying about her, and she herself is too alarmed by the appearance of Simcha. As the story unfolds, the slow-paced drama makes Naomi to face not only her past, but the past of a previous tenant, whose death, she learns soon, was suspicious. As she agrees to help Maya to bring to light whatever happened to the deceased woman, Naomi meets Fabrizio, a priest who agrees to teach her to play the instrument. 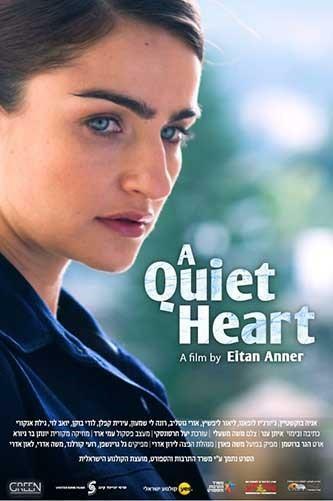 A Quiet Heart’s synopsis or even the review itself may not sound so fascinating, but it’s very engaging and an interesting piece to watch. Games of Thrones’ Ania Bukstein as Naomi is solid and able to carry the entire film on her shoulders. As she delivers an impressive performance, through that it enables you to see Naomi in a different light, understand why she loses her confidence and desire to leave music, but more importantly, you will realize her own reasons to hang on to life itself a bit longer, maybe for a few decades extra. There is an interesting concept in A Quiet Heart and that is something I would like to bring up. It’s a story about a woman who is a concert pianist and wanted to kill herself ; she may repeat her attempt, you never know. But now, as she lives in the same apartment where a woman killed herself, Naomi will have to learn to grow above the pain she has, and find new reasons to keep going. In the end, A Quiet Heart is a movie worthwhile seeing. If you like foreign drama filled with religious values and the importance to overcome an inner pain, then this film should end up in your top ten list.